The city continues to be in grip of dengue but the residents are complaining that fogging operations have not been carried out in some areas. The culture of making different animals, flowers, tribal paintings, religious symbols, etc. on the back and arms in the form of tattoos has gripped youngsters in the city these days. A youth gets his arm tattooed in Ludhiana on Thursday. LIC Housing Finance officials took the physical possession of three properties located near Gurdwara Guru Nanak Darbar, Daba, in Kot Mangl Singh and in Gurpal Nagar for alleged default in repayment of loan totalling around Rs 12 lakh. The Punjab State Veterinary Officers Association (PSVOA) has taken a serious note of the slapping of Dr Balwinder Singh, a service provider, by a veterinary pharmacist in Mansa when he went to join his new place of posting. An all-party religious conference is being organised by the Folklore Research Academy, Amritsar, at Jagaron on October 30. The conference will be attended by leaders of different religions, political and social organisations. The girls of the Guru Harkrishan Public School, Doraha gave an excellent performance in the Punjab Basketball Championship u-14 held at Gurdaspur, recently. According to Ms Manjula, Prinicipal of Guru Harkrishan Public School, seven students from this school represented Punjab in the meet which finished runners-up. The huge turnout of SAD(B) workers, known as Tohra loyalists, at a meeting called by the so-called Tohra faction at Sirhind town on Tuesday, is a clear indication that all is not well in the SAD(B). There was resentment, unrest and disappointment among them and they were highly critical of the SAD(B) leadership. The clash between supporters of Mr Simranjit Singh Mann, president, Akali Dal (Amritsar), and Mr Parkash Singh Badal, president, SAD, was condemned today and observers of the Sikh politics described it as a bad omen for the community. The fratricidal war will not help the Sikhs and the leaders were using the religious places for their political purposes. In a bid to counter the impact of the October 16 SAD rally in Chandigarh, the Congress has planned a show of strength for November 14. The party will be organising a public rally which would be the first in a series of big rallies being planned till the elections. Mr Lal Singh, Minister for Power, presides over a meeting of Congress workers and leaders in Ludhiana on Thursday. — Photo by I.V. A former clerk of Indian Bank, Mr Anil Kumar Bhalla, has not been paid pension since July 24, 2002. The Punjab Government’s announcement to grant interim relief to its staff at the rate of 5 per cent of the basic pay scale has been welcomed but pensioners are sore at the government for not granting them interim relief. The votes of the youth will be a deciding factor in the coming Assembly elections. This was stated by Mr Jasjit Singh, general secretary of the All-India Youth Akali Dal and son of Capt Kanwaljit Singh, former Finance Minister, at a press conference here on Monday. The Dehlon police has registered a case under Sections 364 and 34 of the IPC against Tejinder Singh of Ghungrana and Gurdip Singh of Ramgarh Sardaran on the charge of kidnapping Inderjit Singh in a Scorpio on last Wednesday. A minor girl of Lakkar Mandi had been allegedly abducted by a neighbour on Divali night. A case was registered at the Payal police station last evening. A minor boy of Kohara, who was allegedly kidnapped by a granthi of the same village, was found today by the Sahnewal police from Gurdwara Tahli Sahib (near Gurdwara Aalamgir) in Ludhiana. Submission of Form C is a matter of worry for the industry which has now written to the Chief Minister, Capt Amarinder Singh, to take immediate steps to resolving the issue. The Central Board of Direct Taxes (CBDT) has extended the due date for furnishing returns of income and fringe benefits by corporate tax payers by one month, from October 31 to November 30, 2006. The Deputy Chief Organiser, Public Relation, Mr Inderpal Singh of Guru Gobind Singh Study Circle (GGSSC), said the annual celebrations of the GGSSC will begin tomorrow and conclude on October 29 at the GRD Academy. The Partap College of Education, in collaboration with the Punjab Cultural Promotion Council, is organising Punjab International Folklore Festival on the college premises these days. The inaugural function of the programme was held today. Bulgarian artistes perform during a folklore festival at Partap College of Education in Ludhiana on Thursday. — Photo by I.V. Alumni activities at Sacred Heart Senior Secondary School, BRS Nagar, Ludhiana, were inaugurated on its campus here today. 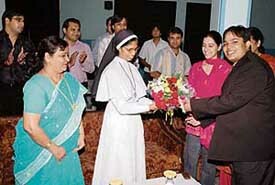 Sister Sobel, Ms Asha Sagar and Ms Rita Gupta welcomed the alumni. The 30th annual conference of the Association of Otolaryngologists of India North Western Zone will be held in Ludhiana on October 28 and 29. 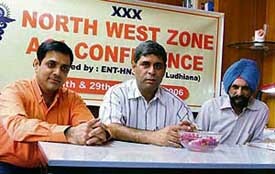 Doctors addresses a press conference in Ludhiana on Thursday. — Photo by I.V. Globalisation and changing scenario is forcing young professionals to work in extremely stressful conditions and this has disturbed their social and family adjustments. A seminar on organ donation was organised by the unit of urology and transplant surgery in Dumra Auditorium of DMCH here today.